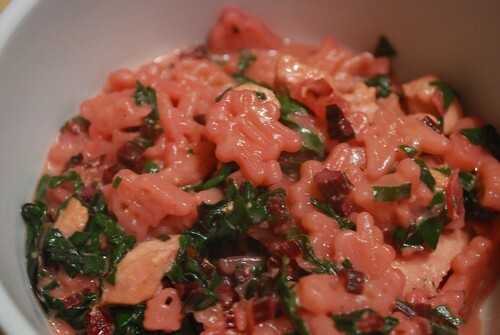 I added beet greens to my mac and cheese and it turned my pasta pink! If you want to add some healthy to your boxed dinner, it was really easy. Make the mac and cheese as directed, but don’t add the milk or the cheese packet. In another pan, saute some onion, garlic and the beet green stems until tender. Add chicken and the beet greens (make sure the beet greens are sliced thinly) and cook until the greens have wilted and the chicken is mostly cooked. Add to the pot with the noodles and butter, mix, and add the milk and cheese packet. Add salt and pepper to taste. Trick your child into eating something healthy. . . .mua ha ha!